ABCs, 123s, math, foods, and more... learning is especially fun when reinforced with a room decorated with our repositionable Education Station Peel & Stick wall decals. Sure to delight children and parents alike, these peel and stick RoomMates Education Station wall stickers are easy to apply and reposition, and feature letters, numbers, math operators, foods, animals, and many other coordinating pieces. 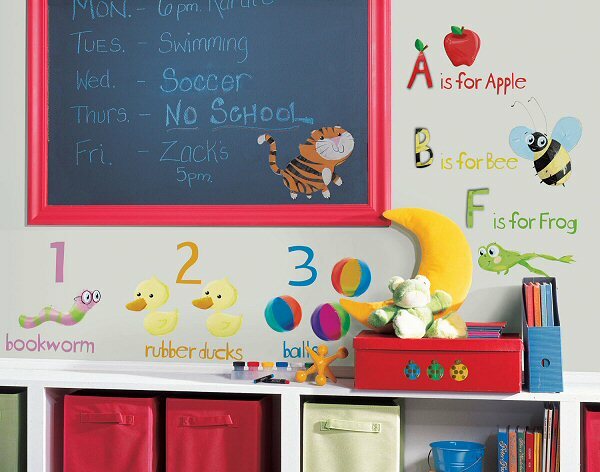 Our RoomMates Education Station wall decals (also known as wall stickers or wall appliques) are repositionable, removable, re-usable, and washable... a parent's dream combination for kids' wall decorations. Whether you are transforming bedroom, playroom, or even classroom walls, our peel and stick Education Station wall stickers offer decorating ease with no damage or residue to the surface when removed. Approx. .5" x .5" to 6" x 7.75"